Tasted ex-chateau and single blind in Southwold. 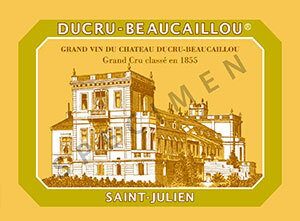 Two bottles were tasted of the Chateau Ducru Beaucaillou 2008. The first had an attractive, almost Margaux-like bouquet with very well integrated new oak and the second exhibiting a more red-fruit aromatic profile. The palate is rich and opulent with copious cedar-infused dark berry fruit, very focused and refined, albeit embellished with a finish ever-so slightly overdone, at least at this early juncture. I found myself offering parsimonious score, but with the pedigree of the estate I think this will age with style. For now I would head for the La Croix de Beaucaillou to see what the Grand Vin decides to do. Tasted January 2012.